Tonight the opening ceremony is on but some competitors have started thier competition . I wish all Australian participants the best of luck and all athletics have a safe and happy games. 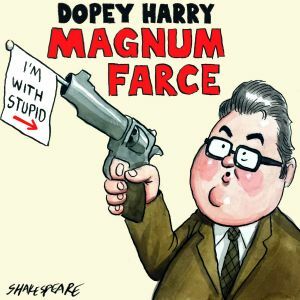 The first time we see a puff piece about barnyard and his ex News corp lover and sprog should be met with howls of indignation over his demands that his private life is private. Imagine if it was a Labor deputy female pm who split from her partner and fell preggers to a toy boy staffer/ she would have to resign within hours . My dog is pretty bright – but that time gap between digging up tasty bits of compost and the consequences of shitting and spewing all over the yard before going to the vet is apparently a tricky one. Whatever the status of the WA Nats, the fed Nats won’t be enjoying the We-don’t-love-you. How about episodes of @ABCthedrum & @QandA devoted entirely to #wildoz & the environment? No politicians, only scientists & conservationists. Tell the Aust'n public the real story about loss of species, feral pests, the effects of climate change, the cost of deforesation? If they’re in the IPA, no worries! …………………Rutherford stands out because he defies the traditional notion of genius. He was a gruff, plain spoken man with a booming voice who came from simple farming roots. He had little patience for philosophizing and even less for high-flying theorizing; he once said that “theorists play games with their symbols while we discover truths about the universe”. And yet he had an eye for theoretical talent that allowed him to nurture Niels Bohr, as dyed-in-the-wool a theoretician and philosopher as you could find. When asked why he adored Bohr in spite of his general disdain for theoreticians, he famously quipped, “Bohr is different. He’s a football player”. A grateful Bohr held Rutherford in immense regard all his life and even named one of his sons after the master. The Rutherford model of the atom (nucleus + electrons) was a key step forward in nuclear physics. The Rutherford gold foil experiment is now called the “Geiger-Marsden experiment(s)”, acknowledging the “doers”, not the lab’s director. I won’t try to explain the quantum physics stuff: it’s weird. ’nuff said. Worth a read, follows on from what kaffeeklatscher said about the WA Nats. Is there a (marketing) linguist in the house? […] which brands (or companies) use digital to create a standout experience. What makes their digital experience so good? The difference with most was Rutherrford was an uber technician and made a lot of the gear himself. Praise be teh Chermans at least still recognise the importance of technicians. I remember my first job as a lowly technician on a DSIR research station. The head scientist at the interview said something that stuck with me. “Scientists have the ideas but it is the technicians who make them work”. Apparently, Bananaby is Australia’s best “retail politician” (a politician soliciting in person for votes from the public). I can’t imagine he has changed many votes – his way. I thought ‘retail politician’ means one who is good at selling themselves to the highest bidder. In Barnaby’s case that would be Gina. Appearing a bit ‘dorky’ rather than slick and polished may well be a plus. Closer to “real people” rather than those professionals in the majors. Rutherford had a real ‘issue’ with his Nobel. OMFG Chemistry ! Is that real science ? As far as he was concerned 🙂 When it came to Nobels though he was good to know. Twelve of his students and co-workers managed to score one. Albo Einstein got his for the photoelectric effect – not relativity. And Schrödinger didn’t get one for his cat. He did and didn’t – but lost the toss. It’s certain that the cat was upset. Maybe. Totally weird. Performance enhancing in curling doesn’t sound right. The SMH editorialises that the Barnaby Joyce issue is poisoning the Coalition. Richo says that Turnbull’s outrage is confected. Google. Mark Kenny says an “increasingly punchy” Joyce’s position is being protected by a paucity of potential replacements. Kate Malby puts it to us that it’s not that MPs are monsters. It’s that their workplace is devoid of normal boundaries, and makes them feel like gods. Among other things Paul Kelly writes “The consequences of the Joyce crisis will be immense. The centre-right governs at the national level only in coalition. This requires two conditions — an effective Nationals leader and working trust between the two party leaders — and both conditions are in jeopardy. The Turnbull government is threatened at its apex.” Google. Bruce Keogh spares a thought for the families embroiled in the Barnaby affair. In a strongly worded contribution Nicholas Stuart writes that our leaders need to be able to sift right from wrong. Janet Albrechtsen has a dip at Turnbull in writing that he knew all the key facts about the Joyce affair long before he blew his top. Google. 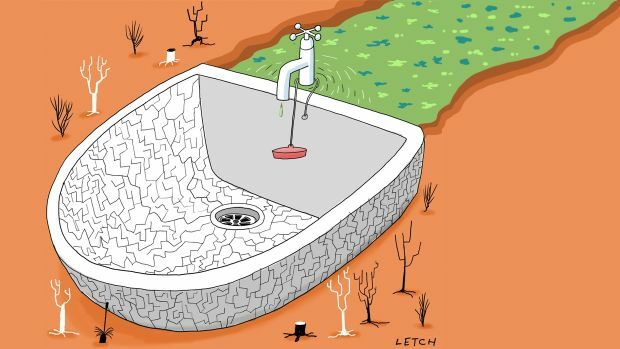 Water management in NSW is a disgrace! Federal ICAC now! Ross Gittins goes right to the heart of the Murray-Darling Basin problem saying that democracy has degenerated into a battle between vested interests. 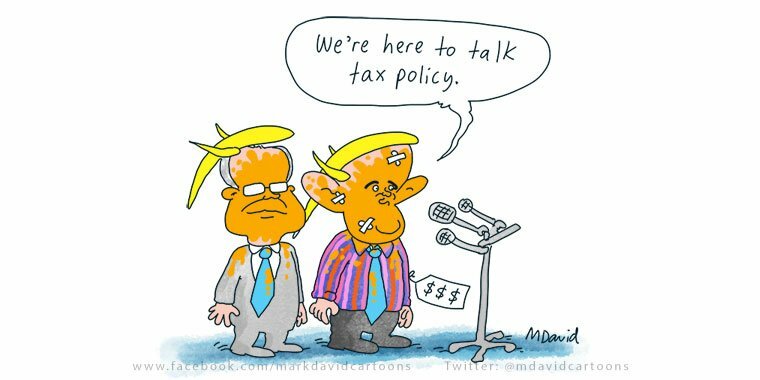 David Wroe says that security will dominate talks between Turnbull and Trump. Around 5000 homes could hand over control of their backyard pools in a $5 million trial to return power back to the grid during peak demand times. Linda Reynolds has called for a national debate on introducing mixed gender competitions to professional sports. You won’t know until you try it she says. The White House has used the Florida school shooting as a circuit breaker. How Donald Trump stacks up against the best — and worst — presidents. Why Facebook is frightened of Mueller. US High school students are rallying against their government and using Australia’s example to make their point on gun control. Canavan has been caught out failing to declare his family home, only seven months after standing down from the frontbench because his mother had told him he may hold Italian citizenship. A Melbourne school banned mobile phones and this is what happened. Eryk Bagshaw writes that two of Australia’s biggest companies, BHP and Thiess, wanted to pick a fight with a militant branch of the mining union to drive down wages and spread a new lower cost labour model through mines around the country. Pat Dodson has accused Turnbull of deliberately throwing out a bipartisan approach to Indigenous constitutional recognition, after a new poll that found 57% of voters — including 38% who typically vote for the Coalition — would support an Indigenous voice model. Another example of a marriage break up ostensibly influence by life in politics. Mueller unseals criminal charges against another one. The New York Times’ Thomas Friedman says Trump is either hiding something so threatening to himself, or he’s criminally incompetent to be commander in chief. That’s telling it straight! Jason Wilson says that in Townsville, the biggest city on the Great Barrier Reef coast, a focus on jobs that are no longer there obscures the facts about the death of the reef. A public broadcaster that bows to political pressure isn’t doing its job. Turnbull’s attack on Emma Alberici for daring to tell some uncomfortable truths is indicative of a global pattern of undermining public institutions and censoring independent journalism, writes Mr Denmore from Failed Estate. Yet another inexcusable problem from Centrelink. Yesterday Geoffrey Rush’s lawyer accused the Telegraph of being on a “crusade” against his client. Surely not that wonderful organ! Stephen Koukoulas looks at Sydney’s stagnating house prices. From the UK Guardian “Corbyn’s no anti-British traitor: the Tory press is playing a risky game. Caitlin Fitzsimmons debunks the myth of the Christian baker. Yet more cuts to ABS staffing. 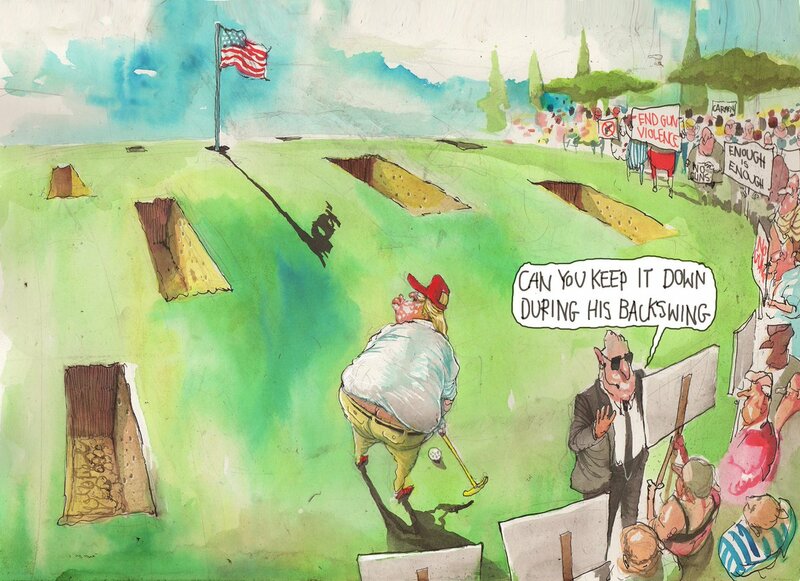 David Rowe knows how to put the boot in! David Pope and Barnaby’s “witch hunt”. Simon Letch with the MDB situation. 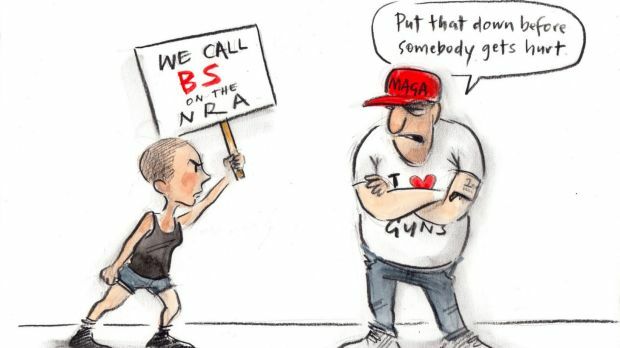 Cathy Wilcox skewers the NRA and its supporters. John Shakespeare nicely portrays Christensen. Mark David follows Turnbull to the US. 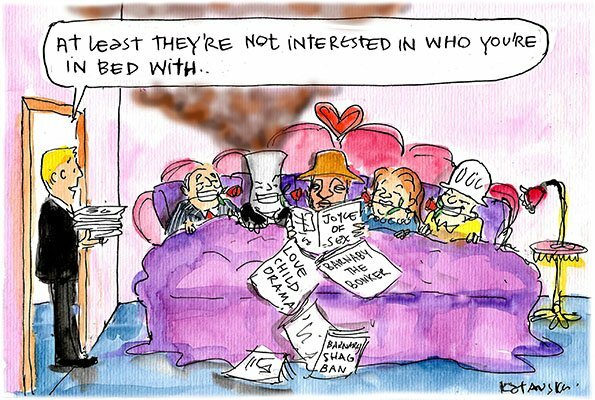 Fiona Katauskas goes into Barnaby’s political bedroom. 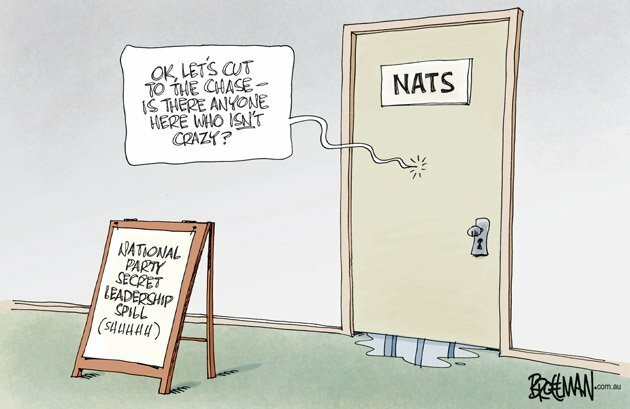 Peter Broelman sums up the REAL problem the Nats have. 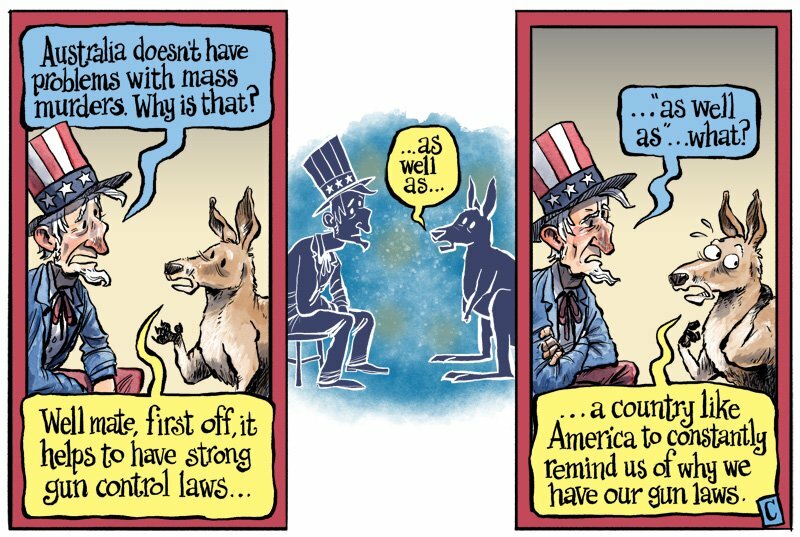 Christopher Downes with a message to the gun-loving USA. Matt Golding has three for us today. 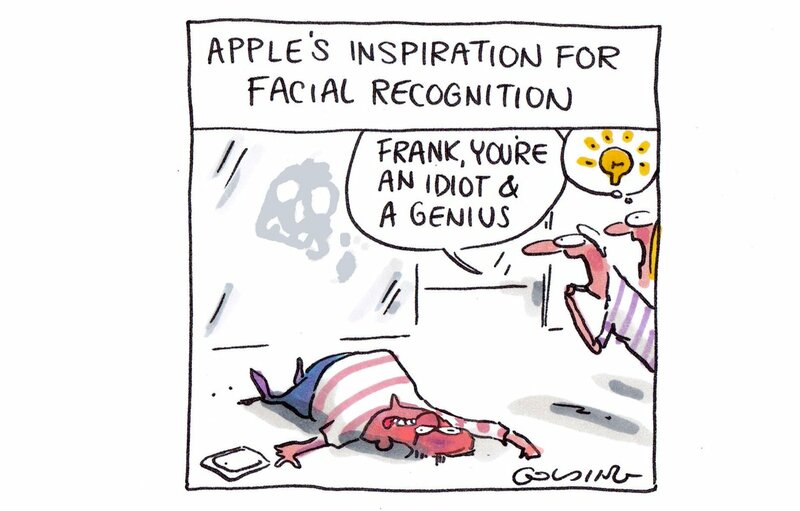 A ripper from Mark Knight. 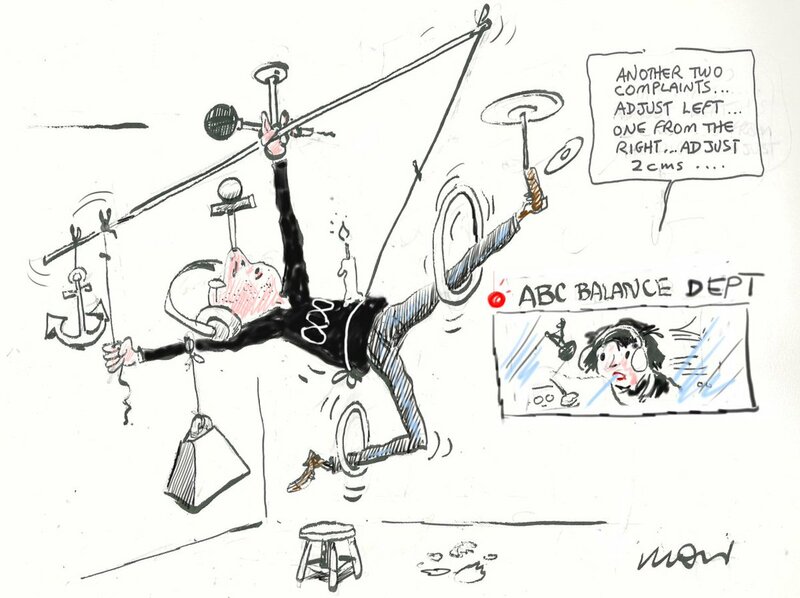 Alan Moir with the ABC’s problems with balance. 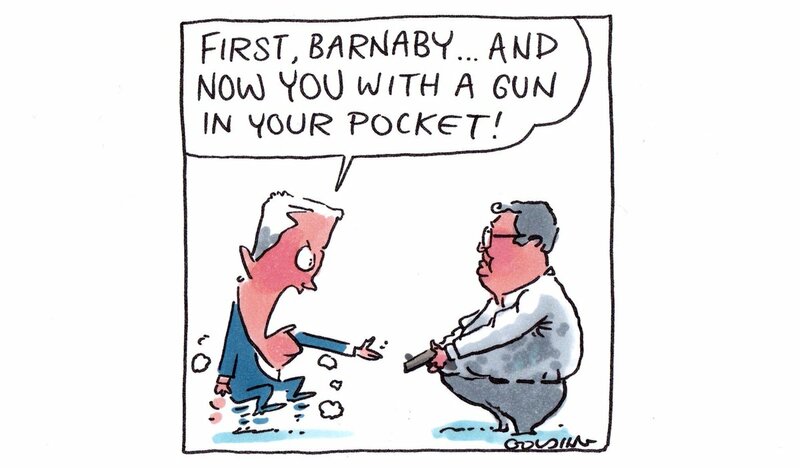 Jon Kudelka and Turnbull’s impotence to deal with Barnaby. Here’s the correct link to the David Wroe article. Adding to the NSW mess over the Murray-Darling water scandals – the NSW minister responsible took a week off in the first sitting of the year to holiday in Tasmania. He must have really needed that break – NSW parliament had been sitting for a whole three days this year before he skipped off. I repeat, Peter Dutton has cancelled the visas of 187 South Sudanese refugees and taken them into immigration detention. 31 have been sent to Christmas Is. Some have been left stateless, so will be indefinitely detained. This will cost taxpayers a whopping $935 000 per week, every week. And you can't deport stateless people. That's a pretty expensive white Australia policy he has there. I suppose that was the intention all along. All planned. I know who I’d like to send to Christmas Island. Indefinite detention, of course. This headline offends me because Disability Support pension is only paid to those people with a permanent stabilised disability. If you are sick or have a temporary disability you have to struggle along on Newstart Allowance. So yes young people who receive a Disability Pension will remain on it until death or they become eligible for the Aged Pension. Statistics manipulated to prove nothing much. Who would have thought people on DSP (young or old) are likely to be on it until they die or get moved to an age pension? I thought that was bleeding obvious, I must have been mistaken. Even when you finally manage to jump though all the hoops, fill in the mountain of paperwork and get approved for DSP they don’t leave you alone. You have to deal with regular ‘reviews’ so some lackey at Centrelink can make sure your missing limbs haven’t regrown, or your need to wear nappies, or have a 24/7 carer has not suddenly healed itself, making you 100% fit for full-time work. The amount of money wasted on this needless busywork and paper-shuffling could pay DSP for hundreds more people. Why do governments, both Labor and Coalition, love to boast about cutting the number of people on DSP? The need for this payment keeps on increasing, and they keep on hacking away at it, keep on making it more and more difficult to get. Why are the ABC and SBS giving Xenophon free publicity? Both have run pointless articles about his campaign ad. Will they also do stories on Labor’s ads? Of course not. I’m fed up with the media trying to influence election results by pandering to the minor parties. First it was Hanson and her rabble of nutters. The MSM told us PHON would win stacks of seats in 2016, that didn’t happen.Hanson won some senate seats and most of those senators or their replacements will go at the next election. 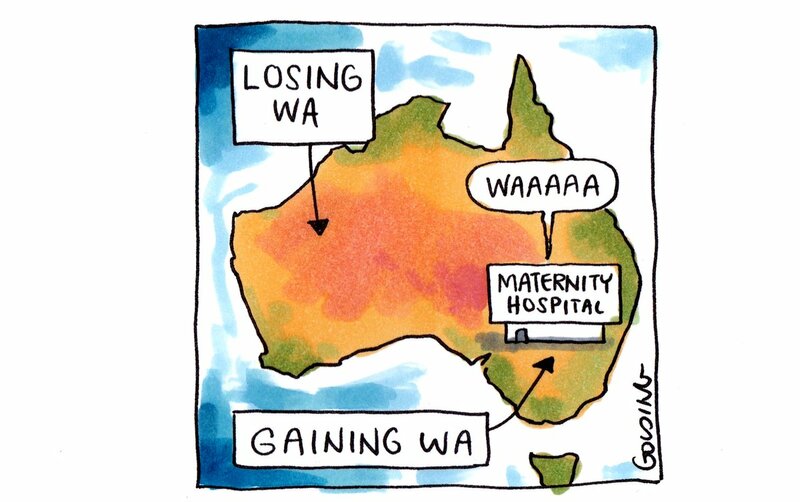 Then they told us PHON would do so well in WA that the party would hold the balance of power. That didn’t happen, the party imploded well ahead of that election. Next they said Hanson’s Queensland election results would give her party the balance of power. Didn’t happen. PHON lost one sitting member and gained one, maintaining their one seat. That’s all. All of this predicting was accompanied by articles about Hanson, interviews with Hanson and regular spots on breakfast TV, for which she was paid. No other party received such favourable treatment, not until now. Now the MSM is doing the same with Xenophon – constantly telling us he will be the next premier of SA or he will hold the balance of power. We get weekly stories telling us how many seats Xenophon is likely to win, or stories about his plans to run candidates in NSW and Victoria. All that does is reinforce the stupidity of having his party use different names in each state. What was he thinking! Going by the past ability of the MSM to accurately predict election results Xenophon is going to fail spectacularly in SA. Now we have to endure crap about his awful election ads. Lots of lovely free publicity. Hanson must be jealous, she has to share the attention and the freebies now. Why do governments, both Labor and Coalition, love to boast about cutting the number of people on DSP? Because decades of Mordor Media sewerage and “Current Affairs” bilge has people convinced that there are armies of people on DSP living a life of luxury. Yes – hordes of people all claiming to have fake bad backs and lolling around at taxpayers expense.. Amanda Vanstone dragged out that line. This would have been around the time I started hearing little old ladies saying ‘this government wants us all to die so they can save money’. A year later and there were more budget cuts, this time the parents of kids with disabilities were the target. Kids with Down Syndrome, among others, were not considered disabled so their parents lost their carers allowances. The outcry was so great – even Alan Jones got on board – that the cuts had to be reversed and families had to be paid back the cut allowances. It is related to that, KK. But there were various influences. When Conrad Black got control of Fairfax in the early 90s he tried to shift it to the Neolib line especially on economics, which were then seriously discussed in the broadsheets opinions and features pages. He used two advocates. Paddy McGuinness and Des Keegan for this purpose. Both had long histories in economics and finance analysis. At this time in their lives, both were fanatics for the cause, still barracking even when Howard announced he was outsourcing the CES (after denying it in the campaign lead-up). The Age, led by Ken Davidson and Tim Colebatch and various centre-left writers, and supported by a well established readership, resisted their efforts. Even I got into letter arguments with Des from time to time. He never made much sense but persisted just like his HUN protege Terry McCrann does today. At one point Des ran a series of articles on the ‘alarming’ growth in DSP pensioners. I could never convince him that the growth, far from being a growth in freeloaders, was quite directly related to labour market failure, especially as low-skilled jobs disappeared with the dropping of tariffs, especially in textiles, clothing and footware but in other manufacturing too. Hawke-Keating offered generous reskilling and relocating packages to soften it, but many could not always fit in to that. In particular there were many low-skilled ex-factory workers who were around 50+ years old. Most had injuries of some sort or another to back or shoulder. Often it was not enough to get the DSP, but it almost guaranteed they could not get work in the unskilled area. What employer would take a risk on an older worker with an injury history when they could take someone half that age who was fit and strong? It led to a labour market failure where we were wasting staff, employers and job-seekers time sending them to job interviews. Yet that was required to get the dole. Many of us reached a deal with DSS, where if they could get a reasonably supporting GP report on their impairment, we’d pass them for DSP. Technically they were not 90% incapacitated, but they were never going to get work. So what Des was complaining about was the very thing he was such an advocate of, allowing the market to sort itself out, or if it couldn’t, just removing these people from the market. Long after Black and Paddy and Des were gone and The Age was back to how it had been, the government (possibly through Brian Howe’s Disability Panels) did agree to a better system where these people could do voluntary work at an approved community organisation for a certain number of hours per week and be spared the timewasting job-search test to claim the benefit. That’s where it all started, but Downward Envy is a powerful weapon for the Right and Murdoch, and they take full advantage. Bullying and shaming disadvantaged people stirs up a bit of fuss. It’s why Porter and Tudge pushed it so hard with Robo-debt, and now Tudge is going after DSP people again. The good news is that both the media and the government have so little credibility that it won’t draw angry voters as Hanson was once able to. Had to go to Centrelink on Monday armed with about 5000 pieces of identity to decide if I was going to stay on Carers pension or go on Aged pension. Person was very nice. Only had to wait about 3/4 hour, so it wasn’t too bad. Also found we had a hatch, match and dispatch office in town, which I have to go to get my original birth certificate. I’ve got my youngest son’s certificate for safe keeping as he tends to lose that sort of stuff, but now I can’t find my own. Razz in on dsp because of the ms, but hasn’t had a review for a very long time. Barnaby Joyce says there was no conflict of interest in his ownership of more than $500,000 worth of land holdings, which is why he did not declare it during cabinet deliberations about an inland rail project that passes within 15km of it. On Wednesday The Daily Telegraph reported Joyce had bought a property in Warrumbungle shire, in northern New South Wales, in July 2006 for $230,000 and added adjacent lots in Gwabegar in February 2008 for $342,571. Joyce declared the rural property at Gwabegar on his register of interests, but reportedly did not declare the land holding in cabinet when in 2016 it passed the proposal for the Melbourne-to-Brisbane inland rail brought by the then-infrastructure minister, Darren Chester. The inland rail project includes 300km of new track between Narromine and Narrabri and passes within 15km of Gwabegar, although the nearest stop is in Narrabri, about 100km or one-and-a-half hour’s drive away. The cabinet handbook states ministers and officials in cabinet “must declare any private interests of which they are aware”. “This can include pecuniary interests, held by them or by members of their immediate family, which may give rise to a conflict with their public duties,” it says. The Daily Telegraph report suggested Joyce could benefit from an uplift in the property value when the inland rail is completed. A spokeswoman for Joyce told Guardian Australia the deputy prime minister had complied with the cabinet rule to declare pecuniary interests. Joyce had no role in selecting the route and had “never had any discussions” with Chester about the inland rail route in NSW, she said. “There has never been a proposal to have a stop near Warrumbungle or Gwabegar,” the spokeswoman said. The land holding is and has always been publicly declared and has been “written and spoken about in numerous media outlets over an extended period of time”, Joyce’s spokeswoman said. The current inland rail route does not go through Gwabegar, but a study of the route in 2010 did examine it passing through Gwabegar as one of four options between Narromine and Moree. At a press conference in Rockhampton, the opposition leader, Bill Shorten, said someone in cabinet had leaked that Joyce didn’t declare a conflict of interest during cabinet deliberations, showing that “[Malcolm] Turnbull’s front bench is undermining each other”. “As to the actual substance – it’s up to the PM to explain: is he satisfied with Mr Joyce’s conduct?” Shorten said. The Labor leader said the Australian public was not interested in Joyce’s private life but “whether there has been any use of public office for private gain”. “People will say what’s going on with special jobs being created? Why does a bloke on $420,000 a year need free rent from a rich property developer mate? The question is – if he’s buying half a million dollars’ worth of land, is it all declared?” Shorten said. After the Florida school shooting, Pia Guerra couldn’t sleep so she began to draw. 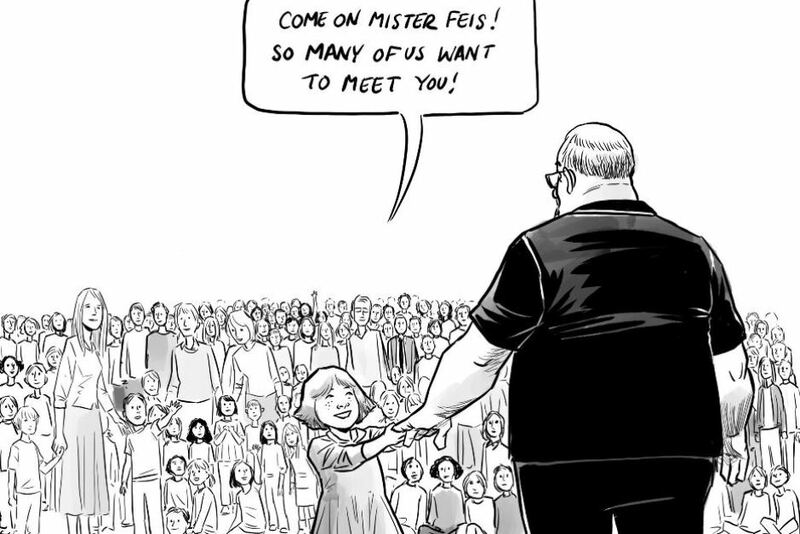 Now the Canadian cartoonist has opened up about the image that has touched thousands. Nineteen-year-old Nikolas Cruz is accused of gunning down 17 people at Marjory Stoneman Douglas High School last week. Among those killed was Aaron Feis, an assistant football coach and security guard who reportedly threw himself in front of students to protect them. It was this man’s heroism that struck a chord with comic book artist Pia Guerra. “It’s not often that an image pops in your brain and you feel a lump in your throat,” she told The Washington Post.